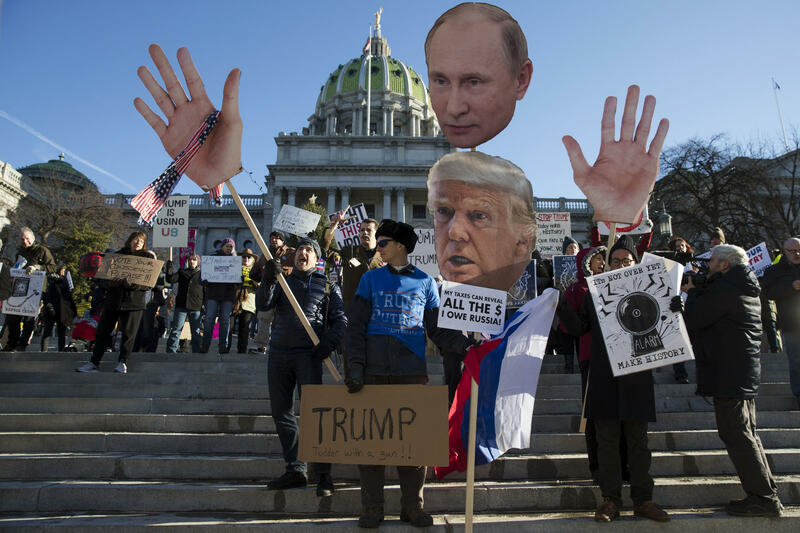 Protesters demonstrate ahead of Pennsylvania's 58th electoral college at the state capitol in Harrisburg, Pa., Monday, Dec. 19, 2016. A state Senate proposal that would essentially charge protesters for being arrested is causing some backlash at the Capitol. The GOP sponsor says it would protect taxpayers from bearing the cost of violent or destructive protests. But opponents say it will infringe on free speech. First-term Republican Senator Scott Martin of Lancaster County said he was inspired to write the bill after hearing of the damage Dakota Access Pipeline protesters did last year. But he noted, it could actually apply much more widely. Under the measure, if protesters are convicted of felonies or misdemeanors, they could be forced to pay the cost of first-responders’ time, as well as be charged for property damage. Martin said peaceful protesters generally wouldn’t have to pay anything, but people engaging in civil disobedience would. Advocacy groups have pushed back, saying Martin’s bill could discourage even nonviolent protesters, and impede free speech. The measure will first be considered in the Senate State Government Committee.